Anne Frank's story is a remarkable one, unbelievably tragic, but sadly not unique. What makes Anne Frank unique is that she wrote her story down on paper, and her writings survived when she did not. She has become a symbol for the Holocaust, providing a face for the unfathomable tragedy that is the murder of six million people. 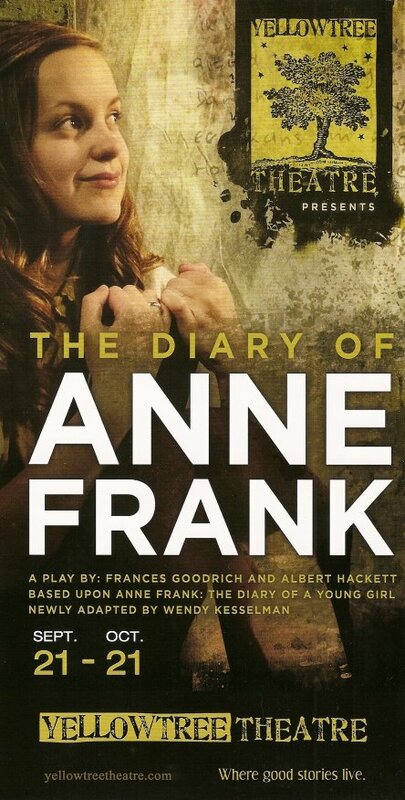 Through Anne's very human writings, filled with not just the atrocities of persecution but also very relatable issues of growing up, we get a glimpse into what it was really like to be a Jew living in Europe during the Nazi era, trying to survive and make some sort of a life for oneself. Anne and her family, along with four other people, lived in a few small rooms above her father's business in Amsterdam for two years, until they were finally discovered and sent to various concentration camps. Anne's father was the only one to survive, and was given Anne's writings from the friends who helped to hide them, who had found the papers after the family was taken away. Otto Frank succeeded in his daughter's wish to publish the diary (she rewrote her original entries after hearing a radio broadcast about collecting diaries and letters as eyewitness accounts of the war). The Diary of a Young Girl was first published in English in 1952, and was adapted into a play in 1955. Yellow Tree Theatre is presenting the revised version of the play from the 1997 revival, and they do a wonderful job with this story. It's a powerful piece of theater. Yellow Tree has gathered a strong cast of favorites and newcomers to the theater, under the direction of Jon Cranney who directed Yellow Tree's last show, The Glass Menagerie. He brings a similar style, raw and natural, to this much larger cast. In fact, it's one of the largest casts I've seen at Yellow Tree. Eight people living in a few small attic rooms is crowded, and ten people on the cozy Yellow Tree stage is too. But it never seems overwhelmingly crowded, everyone moves around the space smoothly and efficiently, even in the quick scene changes. 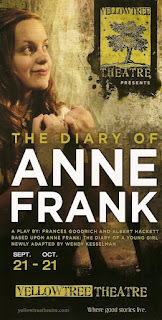 The star of the show is Ali Daniels as Anne Frank. As my friend The Playbill Collector noted, for a college graduate she's a very believable teenager (and she looks a little like a young Judy Garland in braids). Spirited and wide-eyed, but with the wisdom of a child, she successfully conveys Anne's essence, both in conversation with others and in reciting passages from Anne's diary. I was reminded of the History Theater's Coco's Diary this spring, although obviously Anne had a much more difficult life than Coco. But both are insightful observations of the world around them. Real teenager Gabi Jones (she's in 8th grade!) is lovely as Anne's quieter, more obedient older sister. Nathan Surprenant, last seen as Mozart in the whimsical Still Life with Iris, is strong and sympathetic as Anne's father, doing the best he can to protect his family but falling short. He closes the play with a moving soliloquy after the war is over. Also noteworthy are Melanie Wehrmacher as Anne's mother, with whom she has a strained relationship typical of teenage girls and their mother; Ryan Nelson as the dentist who moves in with the two families, providing entertainment and frustration; and Janet Hanson as Mrs. Van Daan, clinging to her fur coat as the last remnant of her old life. As usual, Yellow Tree makes the most of their small stage, transforming it into the cramped but cozy quarters of the families. In a set designed by Rick Polenek, this place that they called home for two years comes to life. Photos from the real location and clever staging help us to imagine what the real hiding place looked and felt like.